Samsung ditches the curve for Q8F flatscreen QLED TVs | What Hi-Fi? The new Q8F TV range comes in 55in and 65in sizes, and is joined by a new 43in 'The Frame' TV. Samsung normally saves its key TV announcements for the CES show in Las Vegas at the start of the year, but this year it's sneaked out a few more models at IFA, Europe's biggest technology show. The new QLED sets are at the premium end of the company's range, bolstering the existing Samsung Q8 range, which sits just below the flagship, super-size only, Q9 range. 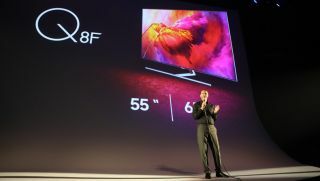 The two new Q8F TVs join the existing Q8C models, and are flatscreen TVs rather than curved TVs - hence the 'F' and 'C'. Samsung says the move is in respone to consumer demand, and it sees the Samsung 2017 TV line-up increased to 14 ranges - eight flat and six curved. Also new is a 43in version of The Frame, Samsung's 'lifestyle TV', which looks not unlike a picture frame and can display works of art and your photographs (which may of course be works of art in their own way). It joins the existing 55in and 65in models of The Frame, which are already on sale. The new Q8F TVs should be available to buy any day and are priced at €2,599 for the 55in and €3,599 for the 65in. The 43in version of The Frame is due in October, priced €1,499. OLED vs QLED: which is better?